The story of St. John Lutheran Church is the story of God acting within the lives of dedicated Christians both pastors and laymen. The story begins over fifty years ago when concerned Lutherans from the surrounding area noted the potentials our community offered a church. Because of an increasingly greater interest in the Houghton Lake area as a vacationland, summer tourists grew in number. To meet the needs and challenges of the expanding community, the resident population of the area grew and new resorts and businesses were established. Mr. & Mrs. Arthur Bechert of Saginaw approached the Mission Board about the establishment of a Lutheran Church at Houghton Lake. Under the direction of the Rev. Emil H. Voss, a member of the Michigan District Mission Board, two candidates for the ministry, Messrs. Gerhard Lewerenz and Albert Firchau, entered the field on July 1, 1940. They were stationed at West Branch where there was a Lutheran Mission served by the pastor from neighboring Pinconning. During the second week of July, the Lutheran Church made its entrance into the Houghton Lake area. A survey was made of the people whose names had been submitted by sister congregations in Saginaw. St. John Evangelical Lutheran Church was organized and the congregation established as a Mission with a group of nine persons: Mrs. Lee Akin, Mr. and Mrs. Harry Blower, Mrs. Ida DeWitt, Mrs. Edna Mandley, Mr. Robert Mandley, Mrs. H.B. Scherping, Mrs. Maurice Sperry, and Mrs. Vernon White. 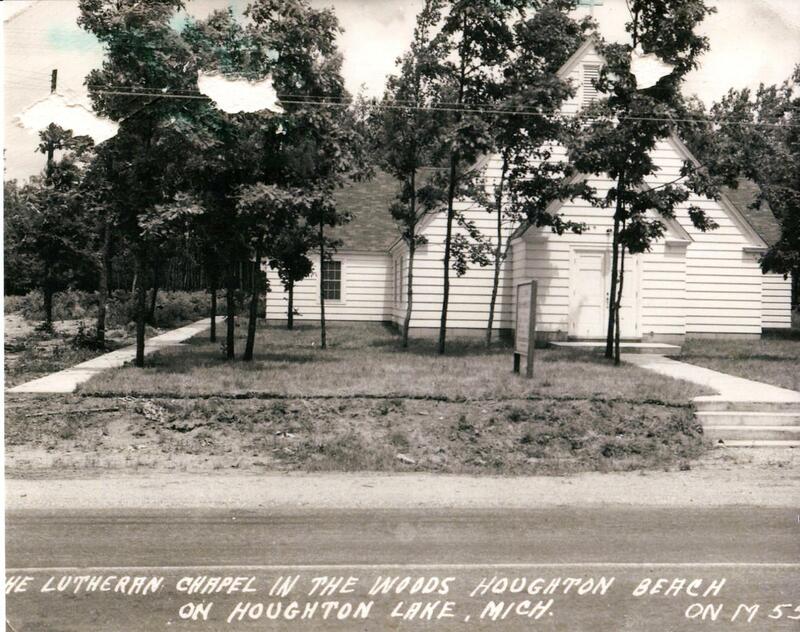 Cards were printed and distributed to cabins around the lake announcing that Lutheran services would be conducted beginning on August 4, 1940, at the Roscommon Township Hall at Houghton Lake. Twenty-two were present at the first service. Candidate Lewerenz left for Indiana on another assignment several weeks later. With the assistance of the Rev. Merle Lutz of Detroit, the groups at Houghton Lake and West Branch consulted together and resolved to request the Mission Board to allow them to Call their first resident pastor. This request was granted and a Call was extended to the candidate, Albert Firchau, in December, 1940, just five months after the work was begun. Pastor Firchau was ordained and installed on January 26, 1941. With a resident pastor now in place, the major concern of the congregation was a church building of its own. Several questions needed to be considered: Where should the chapel be built? What kind of building should it be? How would it be financed? As these questions were faced and answered, it was felt that the Lord guided the members all the way. The realty firm of Boyer and Brice of Flint donated six lots located on the east side of their Houghton Beach Development near the Jonson's Rustic Resort. Additionally, Mrs. Brice later gave several large financial donations to support the work. The Rev. Voss and the Rev. Gold of Detroit, who both took personal and active interest in the work, solicited the Church Extension Board to make funds available to build a chapel on the site. They also engaged Mr. Joseph Goddeyne of Bay City to submit plans for the proposed chapel. Mr. Earl Best was engaged to do the building, Mr. Harry Blower the plumbing and Mr. Barney Scherping the electrical work. Mr. Harry Blower was also appointed Building Chairman. On April 19, 1941, a contract was signed with Mr. Best and the work begun. The new church was constructed in the form of a Tau Cross and would contain nine pews on each side with a seating capacity of 126. The building would consist of the nave, a kitchen, parish hall, pastor's room, hallways, vestibules, restrooms, and a heating room. On February 16, 1941, the first formal congregation meeting of St. John Lutheran Church was held and the first officers were elected. These officers were: Robert Mandley, Chairman; Frieda Sperry, Secretary and Harry Blower, Treasurer. On August 3, 1941, one year after St. John began, the new chapel, known as The Chapel in the Woods, was dedicated. The new Chapel was thronged. Those inside, seated on planks and other makeshift arrangements, and those seated outside on chairs, participating in the service via loud speakers, numbered about 325. Pastor Bernthal of Saginaw served as the dedicatory speaker in the morning service. Mr. Lothar Stolper, organist and choir director of the Holy Cross Church, Saginaw, and the Girls' Choir from Trinity, Saginaw, directed by Mr. Walter Moeller, supplied the special music. Those in attendance agreed that the procession, the worship and the first communion service were a sincere response to the glorious work of God. Following the service, the Martha Society, St. John's first Ladies Aid, served a dinner in the parish hall at the rear of the church. In the afternoon a second Service of Praise was conducted by Pastor Gold, Chairman of the Michigan District Mission Board, and Pastor Voss of Saginaw. On September 1, 1941, a contract was signed with the Manitowoc Church Furniture Company of Waukesha, Wisconsin, for eighteen pews to be delivered during the third week of October. Also in October a used organ was purchased for the Chapel. Delivery of the pews, however, was delayed until March, 1942, because of the company's defense work and its loss of manpower due to the draft. 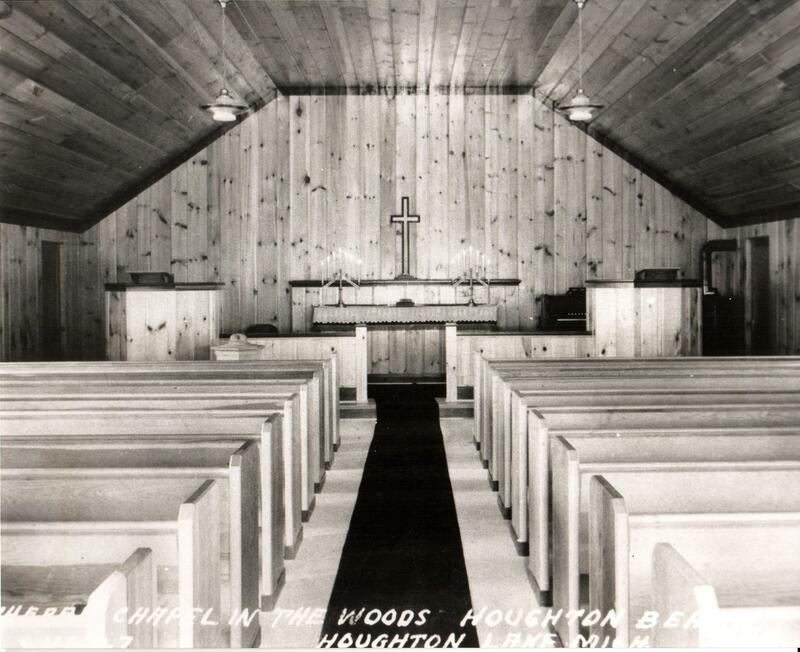 In June, 1942, the sign in front of the church was changed to read, "Lutheran Chapel in the Woods." The Rev. Albert Firchau served St. John from its inception until 1943. That year the Rev. Donald Heitner accepted the Call to the dual parishes of Houghton Lake and West Branch. When Pastor Heitner accepted another Call in 1948, the Rev. Gottfried Press came to care for the spiritual needs of these two flocks. During Rev. Heitner's pastorate additional property was purchased for the church. After the Rev. Press left in 1952, the congregations were without a spiritual leader for a period of one year until the Rev. James Goehner was ordained and installed in July 1953. As a result of generous contributions by congregational members and the Ladies' Aid, the church mortgage was paid. On June 13, 1954, a mortgage burning ceremony was held and a long-desired goal achieved. Due to the unfortunate illness of Pastor Goehner in the spring of 1954, the Mission Board assigned the Rev. Kenneth Behnken to serve the combined needs of the congregations of Houghton Lake and Grayling. After four months, Pastor Behnken left the congregations and Pastor Goehner left in October, 1954. Our first resident pastor, without dual parishes, was the Rev. Gordon H. Light who was installed in October, 1954. The congregation was in the process of building a parsonage which was dedicated on February 16, 1955. In 1958 the church was remodeled and a new parish hall-kitchen area built. The entrance of the Chapel, located on Highway M-55, was transformed into the chancel of the present church and additional pews were placed in the old parish hall enlarging the seating capacity to 220. The new parish hall was dedicated on June 22, 1958. In 1958, Pastor Light accepted a Call to Immanuel Lutheran Church at Sebewaing, Michigan and left St. John in September. A Call was extended to the Rev. Elmer Scheck serving at Cleveland, Tennessee. He accepted the Call and was installed in October, 1958. On May 19, 1963, ground-breaking for a new addition took place. This building project, which would include an overflow area and seven Sunday School rooms, utilized the open space between the church proper and the parish hall-kitchen area. On September 22, 1963, the new facilities were dedicated and on the evening of the same day the new electric organ was also dedicated. The overflow makes St. John very versatile. With the folding curtain towards the church proper open, the church and overflow can accommodate 350 worshippers. With the folding curtain towards the parish hall also open, the church can seat 500 easily. Yet, the overflow also can be used to extend the parish hall facilities. In October, 1964, Pastor Scheck accepted a Call to Immanuel Church at Sebwaing. In January, 1965, a Call was extended to the Rev. Lionel O. Skamser then serving at North Boston, New York. He accepted the Call and was installed in March 1965. On July 25, 1965, St. John celebrated its twenty-fifth anniversary. At the anniversary service, the Rev. James Goehner of Faith Lutheran Church, Bay City, served as liturgist; the Rev. Elmer Scheck of Immanuel, Sebewaing, recited the history of St. John; the Rev. Albert Firchau of St. John, Taylor, delivered the sermon; the Rev. Gordon Light of St. Paul, Trenton, offered the prayers and the Rev. Lionel Skamser, resident pastor of St. John, gave the benediction. By 1965 the major building projects of the church had been completed. What had been a small Chapel in the Woods had become an impressive structure, and the congregation of nine had grown into a family of 210 communicant members. Although the major building projects had been completed by 1965, many improvement and beautification projects took place at St. John over the ensuing twenty-five years. Between 1968 and 1970, a steeple and bell were added over the church entrance, a sloping roof was erected over the overflow and Sunday School area, the exterior of the entire structure was re-shingled, a small storage shed was placed on the premises, and improvements were made in the parsonage. In 1971, Pastor Skamser accepted another Call to Faith Lutheran Church in Bay city and left St. John in March. A Call was extended to the Rev. 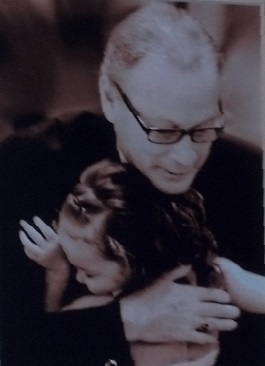 Arnold H. Brammeier, a missionary serving in Ghana, West Africa. He accepted the Call and was installed in May, 1971. In 1973, new carpeting, provided by the Ladies Aid, was laid throughout the church. In 1975, Pastor Brammeier accepted another Call to Peace Lutheran Church in Detroit and left in April. A Call was extended to the Rev. William C. Winter, our present pastor, then serving St. Paul Lutheran Church, Bertrand, Nebraska. Pastor Winter was installed on November 2, 1975. During the interim between pastors, the Rev. Paul Weber of Mt. Hope, Grayling, served as Vacancy Pastor. As early as 1967, the Ladies Aid had expressed the need for more kitchen space. It was not until the mid-1970's that this goal was realized. The Ladies Aid assumed both the planning and financial responsibilities for this undertaking and in the summer of 1977 the kitchen area was enlarged to its present size. In 1973, an Organ Fund was established and in 1979 a new organ was purchased. The decade of the eighties saw many projects at St. John. In 1982, new hymnals were purchased for the parishioners and new carpeting was laid in the parsonage with half the cost paid by the Ladies Aid in the latter case. In 1983, the chancel area of the church was remodeled. A major objective of this project was to provide more rail space for communicants. The organ was moved from the front of the church to its present location. The pulpit and lecturn were moved and a free standing altar erected which permits the pastor to face his congregation during the liturgy and prayers. The communion rails were moved forward to allow the first step of the chancel area to be used as a kneeling pad and to increase the length of the communion rails. Because of its many activities, the Ladies Aid required additional storage space to house items for rummage sales and bazaars. In 1983, the small storage shed was replaced with a larger storage building. Partitioned down the middle with an entrance for each half, the building serves as a storage facility for both the Ladies Aid and the church. Half the cost for this project was borne by the Ladies Aid. The next five years saw several major improvement projects for the church and parsonage. These projects included a new heating system and vinyl siding for the church and parsonage; blacktop for the parking lot; stained glass windows in the nave and pastor's study; remodeled restrooms in the parish hall, a project of the Ladies Aid; remodeling for the parsonage and an addition to the parsonage garage. When St. John was first organized in 1940, the Mission Board questioned whether the endeavor would succeed since some other undertakings of this nature had to be abandoned because of lack of local support. In these days of 1990, we read and hear of church closings because of lack of funds and parishioners. yet, St. John has persisted and grown into a family of 475 communicant members. On the fiftieth anniversary of St. John we raised our hearts and voices in thanksgiving and praise to our Triune God who had blessed us so richly. To the first nine He gave the faith and courage to begin the venture; to the many men and women who have contributed to the growth of St. John, He gave the faith, wisdom and foresight to forge ever onward; to the ten devoted pastors He sent to shepherd us, He gave the faith and patience to guide us on the way. We give our thanks to all those who labored so valiantly to make St. John what it is today; to our God we give all the glory. As we began our second fifty years, we pray that as He blessed and guided the members of the Chapel in the Woods through all the yesterdays, so will He guide and prosper the congregation of St. John through all the tomorrows. Over the next five years, the Ladies Aid continued to support missionary efforts in Nigeria through the Together in Mission program. The congregation also voted to support a missionary in the Philippines through the same program. In 1993, following the massive floods in Iowa, in addition to financial support contributed by the congregation, four members of the congregation traveled to Des Moines to help with recovery efforts. In that same year Pastor moved into his own home and the parsonage was rented. Because we had a large increase in Sunday School attendance and limited facilities, a building committee was appointed in 1994 to consider plans for providing additional space. At the annual congregational meeting in June, the congregation approved enlarging the facilities. A Building Fund was created and the Board of Directors appointed a Building Oversight Committee. The Church Extension Fund approved a $175,000 loan for the project and in May, 1995, the contract was awarded to a local contractor and construction was begun. The major construction was on the east side of the existing building. The nave was enlarged with choir and organ areas. Also added were a sacristy, a meeting room, a choir room, as well as several classrooms. A basement was also constructed under the new classrooms. A wing was added to the north side of the Parish Hall. Included in this new construction were restrooms for men and women, as well as new offices for the Pastor and secretary. This wing also included a new entrance opening onto a covered drive-through. A restroom was added in the kitchen area. Pastor's old office, off the narthex, was used as a cloakroom until 2003 when the Ladies Aid converted it into a lending library. In addition to the new construction, a new heating system and air conditioning were installed. Because of construction, Vacation Bible School was held under a large tent on the grassy area beyond the parking lot with a daily attendance of 73-93 children. Thirty-three students attended the first session of Sunday School that autumn. During the next five years several events occurred. On June 9, 1996, the new addition was dedicated with a service of Praise and Thanksgiving. 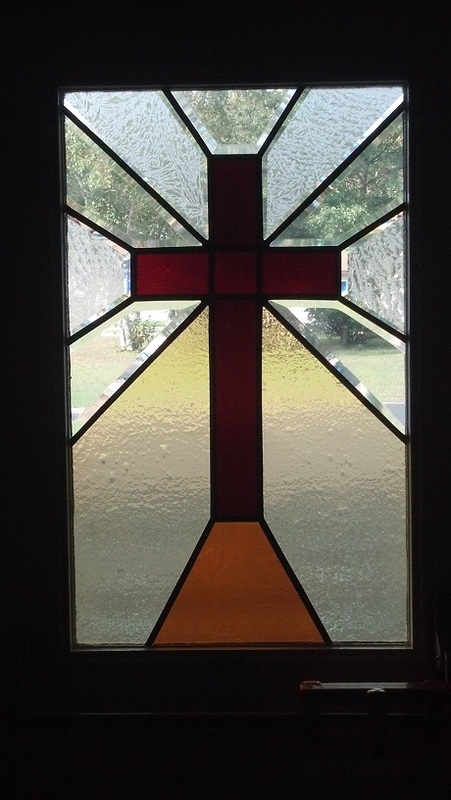 During this period new windows were installed in the Parish Hall, the parking lot was expanded, a Processional Cross was acquired, and the pew cushions were replaced. The Ladies Aid also provided new carpeting for the Parish Hall. Also during this period, a softball team was formed, the congregation became involved with the Adopt-a-Highway program, new altar paraments were purchased, and the trustees' garage was enlarged. On Reformation Day, 1997, we celebrated the 150th Anniversary of the Lutheran Church Missouri Synod using the traditional seating arrangement - men on one side, women on the other - at the worship service. In June, 1998, we celebrated Pastor Winter's 25 years in the Ministry with a catered dinner and social hour at the local VFW Hall. In 1999, the mortgage for the building addition was paid off. Over the next five years several changes occurred. Our constitution was revised and approved by the Michigan District, LCMS, a new piano was purchased, a new sound system was installed, and we celebrated Pastor Winter's 25th anniversary at St. John. Various church groups began serving suppers prior to the Advent and Lent Wednesday evening church services during this period. The first Advent by Candlelight program was sponsored by the Ladies Aid and Lutheran Women's Missionary League (LWML). A property search committee was appointed by the Board of Directors to look for property to be purchased for future development. In 2000, a plot of 32 acres was purchased on Reserve Road for $200,250 on a 15-year Land Contract. After the purchase of the property, the old log cabin on the site was offered to the Houghton Lake Historical Society and was moved to the Society's site in October, 2003. In August, 2000, the first congregational picnic was held at the new property and in October, a Saturday evening Vespers service was conducted there. A monetary Thank You gift was received from the members of Mt. 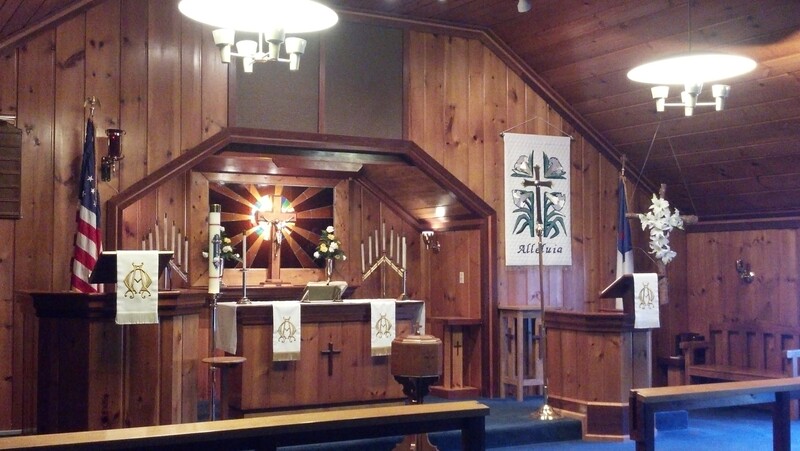 Hope Lutheran Church in Grayling for allowing our Pastor to serve their vacancy over an extended period of time. A decision was made to install a flagpole near the west entrance to the Parish Hall to commemorate the gift. On October 5, 2003, the flagpole and plaque were dedicated. During this period our Youth Group was very active. The members held regular meetings, attended conferences in other localities and held fundraisers. In 2001, several youths attended the National Lutheran Youth Fellowship Convention in New Orleans and in 2004, the NLYFC in Florida. In 2002, discussions were held about hiring a Director of Christian Education (DCE) jointly with Our Savior in Gladwin, and in 2003, we jointly applied for a DCE intern from Concordia University - St. Paul. The intern arrived in August and was housed in the St. John parsonage. Over the next five years (2003-2008), several events occurred. A Puppet Ministry was formed and a Blended Worship service was begun with music provided by our Praise Team at the 8 o'clock service. The kitchen was repainted and new countertops installed. Repairs were also made to the Bell Tower. The congregation, along with Ladies Aid and LWML, provided $10,000 in relief aid to the victims of Hurricane Katrina. In October, 2005, we celebrated Pastor Winter's 30 years of service to St. John. In May, 2005, the FINAL PAYMENT was made on the Reserve Road property. During this same year, the altar area was enlarged by removing two pews, new LSB Hymnals were purchased as well as a new funeral pall and carillon system. In 2006, congregation members were requested to bring canned or packaged food items, as well as paper and cleaning products, to the Advent and Lent suppers to be used for holiday baskets for the needy with the excess being donated to Project H.O.P.E. To eliminate the necessity of erecting tents for our annual picnics, the congregation approved the erection of a covered pavilion at the Reserve Road property in 2009. That year a new organ was also purchased. In 2010 an area was cleared at the Reserve Road property to be used as a garden by congregation members. The area was divided into plots and members could apply for individual whole or half plots. The garden area was enclosed by an electric fence donated by the Ladies Aid. Excess produce was available for church members or donated to Project H.O.P.E. In 2011, the church and parsonage received new roofs and the lights in the Parish Hall were upgraded to provide greater efficiency. In 2013, the Ladies Aid purchased padded folding chairs for the Parish Hall. 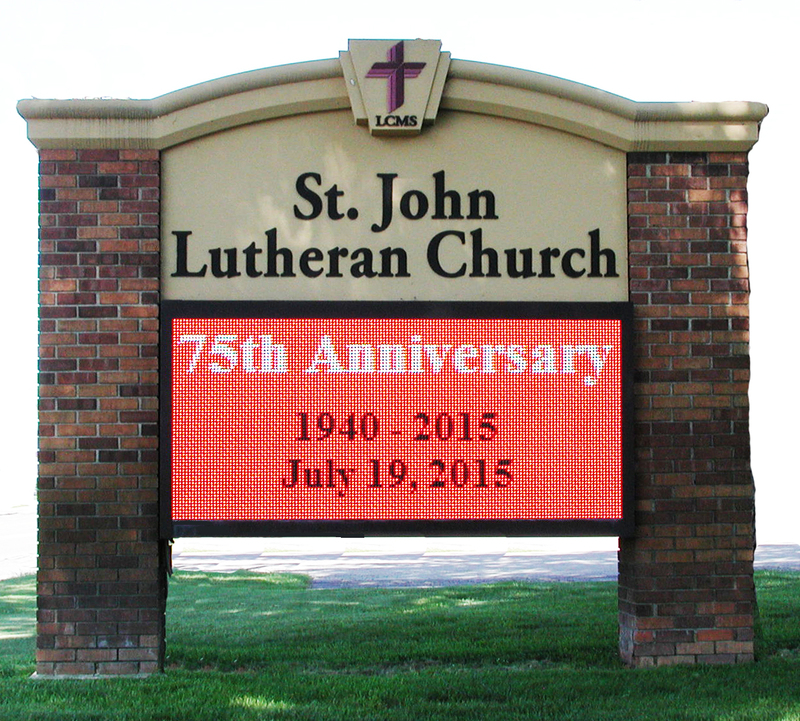 Also that year a new electronic sign was installed in front of the church. In the summer of 2013, evening services were begun at the Reserve Road property on non-communion Saturdays between Memorial Day and Labor Day with the Praise Team providing the music for one service each month. In 2013, the Board of Directors also approved our partnering with Centershot Ministries, a Christian-based program involving youth and archery training. The first Family Fun Fest was held in September, 2013, followed by the second in 2014 at the pavilion on Reserve Road. During the first 35 years, 1940-1975, St. John was served by eight pastors. For the past 40 years, 1975-2015, we have been blessed with one shepherd. In 2013, Pastor Winter was recognized at the North and East Pastors' Conference for his 40 years of service in the ministry. We also celebrated this milestone following a Sunday morning service. During the past 25 years we can claim many achievements by God's grace - not only tangible such as enlarging our facilities and acquiring additional property - but intangible as well. Over the years our congregation has given financial support to six seminarians, either by grants or monthly stipends during their entire seminary training. In addition, over a five year period $30,000 was donated to the Michigan District, LCMS to provide financial support for young adults training for church work. Our Ladies Aid has annually supported the seminary food banks which provide food for seminarians and their families. The Ladies Aid has also continually provided luncheons for family and friends attending funerals of deceased congregational members. Our trustees have been faithful in making repairs, mowing lawns, and otherwise taking care of our property. We have supported missionary efforts in the Philippines, Nigeria, Guatemala, Paraguay, and Guinea through Together in Mission and Lutheran Global Outreach over the past 25 years. Our congregation members have generously supplied financial support for victims of weather-related disasters including the floods in Iowa, tornadoes in Oklahoma, and Hurricane Katrina in New Orleans. Our local LWML group has made quilts, gathered and packed school kits, and prepared packages of baby necessities for distribution overseas. Local charitable organizations such as Project H.O.P.E., Right to Life, and River House have also received our support. As we review the past 25 years we may rightly celebrate our many accomplishments. However, we must remember that all of the praise and glory belong to our Triune God who gave us both the will and resources to achieve them. So, let us give praise to our Lord and say a sincere thank you to "God, our help in ages past, Our hope for years to come!" (LSB 733). Amen and Amen. In 1940, it was determined that Sunday offerings would have to average at least $5.80 per week to pay the pastor's salary which was $25.00 per month. For the month of January, 1942, the electric bill for the church was $1.00; for January, 1990, it was $165.00. The total cost of all purchased real estate was $2,000. It cost over $20,000 to blacktop the parking lot. The building costs for the first Chapel totaled $7,000. The stained glass windows in the nave and pastor's study cost $5,000. It cost $11,500 to build the parsonage. The new roof for the church buildings cost $18,000. In 1941, the Martha Society voted to pay $5.00 per month for the pastor's car expenses to travel between Houghton Lake and West Branch. In 1942, the congregation voted to charge congregational member $1.00 to use the parish hall for non-church connected social activities. In 1946, non-members were to pay $2.00 to use the kitchen and parish hall. In 1940, St. John was begun as a Mission. In 1988, the Ladies Aid voted to sponsor a missionary in Nigeria, West Africa. On July 22, 1990, we celebrated our 50th anniversary with a church service followed by a catered meal served under a large tent erected in the parking lot. Memorabilia for the event included sweatshirts and coffee mugs.